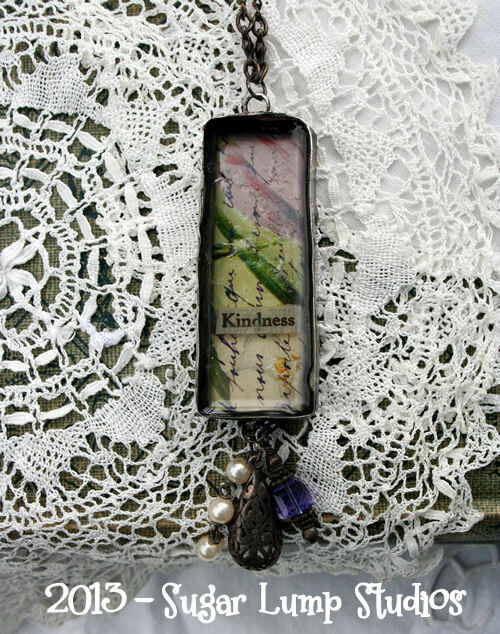 Way back in April, I enrolled in the online course Soulful Adornments with instructor Terri Heinz of artfulaffirmations.blogspot.com and finally I am posting my first little piece that was constructed during this class. I was so excited to take part because soldering was a new avenue for me, but also because in December 2011 I met Miss Terri as she traveled through Michigan. My necklace was made from old broken jewelry bits that came out of my own jewelry box, and a vintage rosary that I purchased. I love PURPLE so I was able to incorporate that into the piece as well. My first beveled walls are a little crooked and quirky – but I did enjoy the process. The hardest part for me is shutting jump rings – something I am working on. Terri’s class was worth every penny! I learned so much and do hope to make many more of these altered adornments…and maybe make one as “beautimous” as her art one day! Oooooh, your soldering piece is marvelous, I won’t be concerned about your “crooked and quirky” beveled walls, that adds to the personality of your piece. 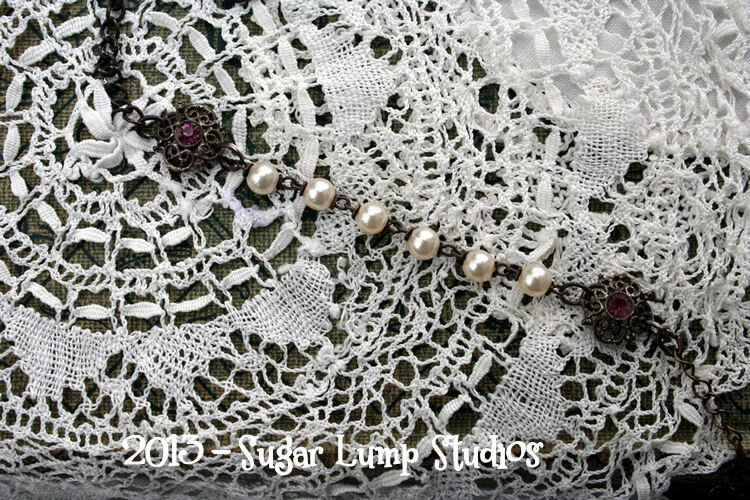 Luv how you added the various decorative beads, like you, the purple is my favorite. Had my first taste of Fall “chill” this morning, 46° !!! Burrrrr . . . .
It’s beautiful. Soldering is on my to do list! It is lovely! Soldering is on my to do list! Wonder what damage I could do with a solder? Nancy, this is quite gorgeous and I would never guess it was a first try! Love it, my dear! Hope you have a wonderful weekend. I have returned from Portland! Hugs! So beautiful Nancy! I thing soldering is an added talent for you!! Just beautiful Nancy. Always wanted to try this. Seems not enough hours in my day. Great job, Nancy! The necklace is beautiful and it’s great that you enjoyed the class. Have fun soldering more pieces. I like how it has such beauty and personality. Dear Nancy, this is a beautiful, and so lovely piece. I would have loved being in dear Terri`s workshop,- but all that have to wait till I`m free of my shop!! 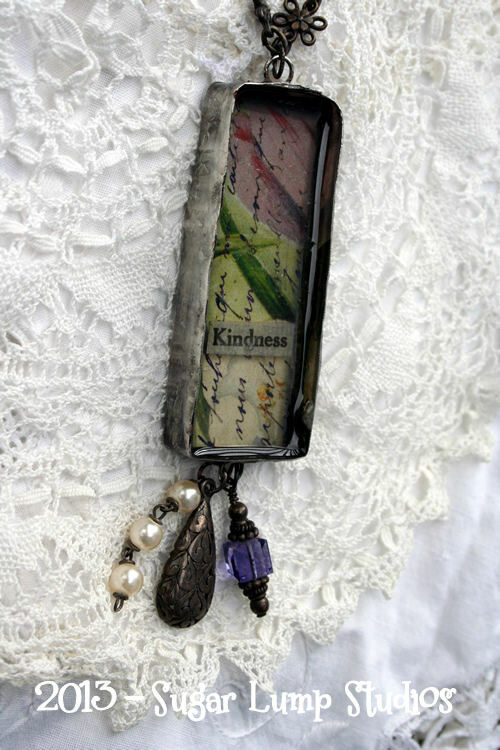 Your necklace is wonderful and I love you used the word : Kindness- you are one of the kindest people ,dear friend!! 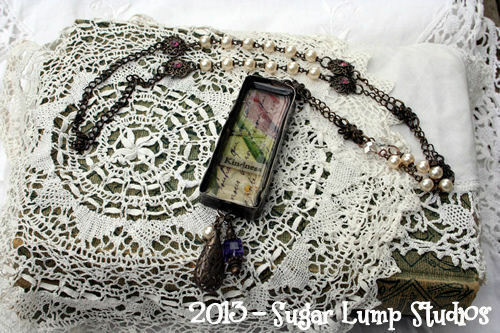 The rosary is a gorgeous piece -and goes so well with the soldered “box” with the same colour in your background! !-and I love your dangling bits !! gorgeous necklace Nancy!!! I contemplated Terri’s class because I knew it would be a great class but I was intimidated-never having soldered before. You did such a lovely job on your first piece! The necklace you’ve made is really a beautiful piece of jewellery. Your necklace is so lovely! I think the walls look just right. They have an aged look, as if the necklace had been worn many times over the years, maybe even worried by loving hands. I also love your theme! The bezel looks amazing to me and you really did a gorgeous job creating the complimenting beaded necklace. Thank you for your kind words about my workshop. I am so glad you enjoyed it. I look forward to seeing your other necklaces you are working on. Yay!